Another Product From The Dollar Store With Delightfully Anachronistic Packaging That You’ll Want To Know About! Like you, I’ve got this weird thing for food items I find at the dollar store that feature package design that looks very dated! So you’re not alone! Today’s offering is a can of German potato salad. Yes, you heard me right (if you’re enjoying this web page with some sort of text-to-speech software) – a can of German potato salad! 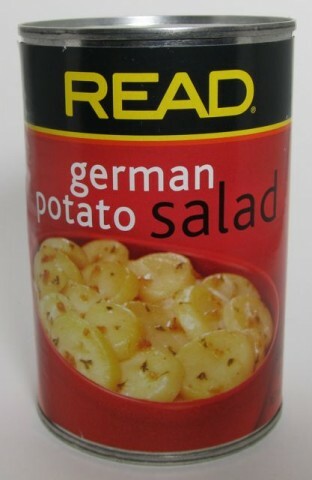 This can of READ German Potato Salad looks like it’s from…the mid-1970s. They put “online community” in quotes! That’s Zooey Deschanel-level adorable! Awww! Where You’d Expect to See It: On the workbench, empty and holding loose nuts and bolts in Grandpa’s garage. I’m no longer defining just what it is that makes a package’s design look so dated because I’d be pointing out the obvious. There’s no reason to note the specific typefaces, photos, and colors that make each product appear old – you’re as big a fan of anachronistic package design as I am so you see it as well as I do. That’s why you and me get along so well, sure. READ German Potato Salad comes to us from the local Dollar Tree. Last night I ate it. It was good. Tangy, it was. Tangy. It did give the cat gas, so just bear that in mind if you let her lick the bowl when you’re through. Anyway, this can cost me a dollar, and I did buy it for the blog, so if you want to send me a dollar, I think that’s fair. Also the READ German Potato Salad people can send me more of this stuff for free or maybe some money for giving it a nice plug. Whaddaya say? I’m happy to get the ol’ Ted Parsnips Web Design Team back to work and have them put a banner on top that reads something like “READ German Potato Salad presents The Ted Parsnips Hour.” That’s assuming that every time you come here, you spend around an hour, which I think is a pretty fair assumption. Now for a few thousand dollars less, we could do “The Ted Parsnips Hour, brought to you by READ German Potato Salad – the tangy German potato salad!” with the product name below mine. But I would hold up the can every few minutes while I write these posts. Anyway, READ German potato salad people, my attorney will be in touch to hammer out the details. Let’s get this thing rolling. Posted by Ted on August 25, 2011, 9:00 AM.